The earliest hunter-gatherers in southern Africa were the San people. The San were also known as 'Bushmen', a term used by the European Colonists that is now considered derogatory. The San populated South Africa long before the arrival of the Bantu-speaking nations, and thousands of years before the arrival of Europeans. San languages, characterised by implosive consonants or 'clicks', belonged to a totally different language family from those of the Bantu speakers. Broadly speaking, they are two different and identifiable languages, namely the Khoikhoi and San. Many dialects have evolved from these, including /Xam, N?Â¡, !Xu, Khwe and Khomani. NÁƒ mÁƒÂ¡, previously called Hottentot, is the most populous and widespread of the Khoikhoi and San languages. Very little is known about the different dialects of South Africa's San people, as most of these beautiful, ancient languages were never recorded. Fortunately, the /Xam dialect, which is spoken by the San, was recorded almost in its entirety, thanks to the work of a German linguist, Dr WHI Bleek. /Xam speakers originally occupied a large part of western South Africa, but by 1850, only a few hundred /Xam speakers lived in remote parts of the Northern Cape. Today, the language is no longer exists, but survives in 12 000 pages of hand-written testimony taken down word-for-word from some of the last /Xam speakers in the 1860s and 1870s. These pages record not just the /Xam language, but also their myths, beliefs and rituals. A comprehensive /Xam dictionary was produced by Dr Bleek at the time, but was only published years later (DF Bleek: 1956). South Africa's motto, written on the SA coat of arms is a /Xam phrase: !ke e: /xarra //ke, literally meaning: diverse people unite. Archaeological evidence shows that South Africa was part of a large region, including North and East Africa, in which modern humans first evolved and lived. Hundreds of thousands of generations of Stone Age hunter-gatherers populated the South African landscape for nearly two million years, yet for most of that time we know nothing of their names, language, memories beliefs, wars or alliances. The San are the best model we have for the hunter-gatherer lifestyle that saw so many generations through the Stone Age, and it is tempting to say that the history of the later Stone Age is the history of the San. This can only be done at a very broad level of generalization, but evidence does points to a 'San' history. For example, human skeletal remains buried mainly in the last 10 000 years are broadly similar to those of the ninetieth and twentieth century San people. The 'toolkits' of the more modern San people are similar to those artefacts found and dated back to later Stone Age hunter-gatherers. Finally, the uniqueness and diversity of the San 'click' languages suggest very ancient roots that possibly date back into the middle Stone Age period. There are three kinds of evidence that give us clues as to the development of the early South African hunter-gatherers and later the San. These consist of human bone fragments and art artefacts (like beadwork and rock art) as well as the examination of the places where these people lived, and the food remains that they left behind. Rock art by the late Stone Age hunter-gatherers can be found in the form of paintings or engravings in almost every district in South Africa. There is no comprehensive list of all sites, and many have not been recorded, but it is estimated that there are at least 20 000 to 30 000 sites and well over a million individual images. Although many are not well preserved, collectively they represent a remarkable record of the beliefs and cultural practices of the people who made them. Most were created by San hunter-gatherers, but Khoikhoi herders and Iron Age farmers added to the collection. Khoikhoi herders who brought sheep and cattle into this part of South Africa within the last 2 000 years were probably responsible for the most recent phase of painting, in which the paint was applied with a finger instead of a brush. The colours are mostly monochrome and the subject matter is frequently non-representational patterns with symbolic meaning. As the Khoikhoi settled on the land formerly occupied by hunter-gatherers, the San gradually stopped painting as their numbers and cultural activities declined. The San have a rich oral history and have passed stories down from generation to generation. The oldest rock paintings they created are in Namibia and have been radiocarbon-dated to be 26 000 years old. The San rock art gives us clues about their social and belief systems. One of the most significant pieces of Rock art found in South Africa was found on Linton Farm in the Eastern Cape. The panel was removed from the farm in 1917 and taken to the South African Museum in Cape Town. It is known as the Linton panel, and an image from this panel was used in the new South African Coat of Arms. Eighty-three years in museum care, protected from the elements, has made the Linton panel one of the best preserved of all pieces of South African rock art. In 1995, the panel featured as one of the premiere attractions in the international exhibition, "Africa: the Art of a Continent". The figure embodies the spirit of the African Renaissance. When European nations began their Renaissance, they turned to the classical age of Greece and Rome when art and architecture had reached its zenith. San rock art is one of the great archaeological wonders of the world, and is a mirror which reflects the glories of the African past. Our knowledge of South African San texts (especially the 12 000 pages of testimony collected by Dr Bleek), combined with the study of the rituals and beliefs of San people still living in the Kalahari, allows us to understand many of the paintings in the Linton panel. The panel shows people capturing a power the /Xam called !Gi. The San sought and used this power for the benefit of their community ,as it allowed for the healing of the sick and for the healing of divisions within society. San rock art was believed to be rich in this special power. The ability of Later Stone Age hunter-gatherers to sustain themselves was seriously challenged at least three times in the past 2 000 years. Firstly, this occurred with the southward migration of the Khoikhoi herders into the western half of the country. Although they appear to have developed a symbiotic relationship with the hunter-gatherers, they converted individuals to herding, and therefore weakened hunter-gatherer social cohesion. Secondly, hunter-gatherers were challenged in the north and east of South Africa, as Iron Age farmers (Nguni and later Sotho nations) had settled in the summer rainfall regions within the last 1 800 years to grow crops and tend their stock. They also lived alongside hunter-gatherers, particularly in the Drakensberg region, and developed a working relationship with them. However, they became more and more powerful in terms of population size and land ownership. Finally, the death knell came with the arrival of European colonists whose commandos with guns and horses decimated the hunter-gatherers within two centuries. Some of this history is reflected in the rock art of the later Stone Age. 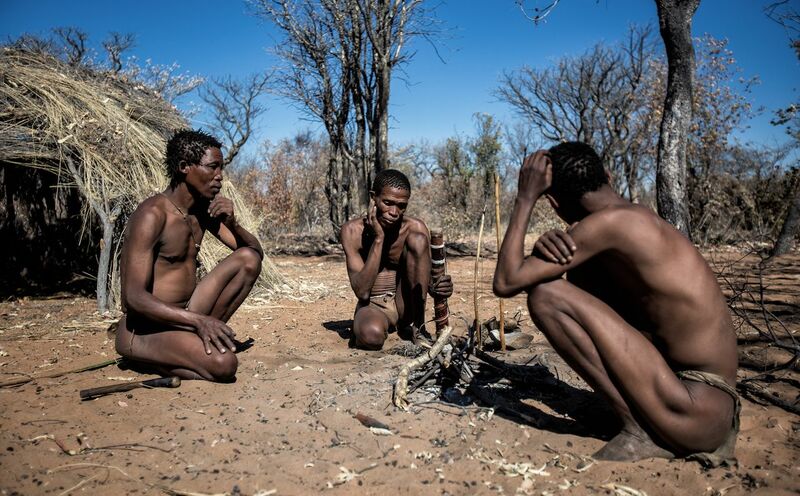 In the 1950s, several thousand San people were still hunting large game with poisoned arrows and gathering plant food in the Kalahari Desert in Namibia. One group, the !Kung, lived in an area called Nyae Nyae (pronounced ny ny, rhyming with high), near the border between Namibia and Botswana. The !Kung were able to continue their ancient way of life largely because they lived in an area that was very difficult to reach. A stretch of land of about 200 km, waterless for most of the year, lay between the closest farms and the Nyae Nyae area. Travelling across this area, even in trucks, was difficult. Vehicles would get stuck in the sand, tyres would get punctured or the seeds of the tall, dry grasses would clog up their radiators causing them to boil. These factors helped to protect the !Kung way of life from outside influences until about thirty years ago. In the 1960s, the Department of Nature Conservation began to take over large sections of the traditional hunting lands of the Kalahari San for game and nature reserves. A law passed in 1970 meant that the !Kung lost 90% of their traditional land in Nyae Nyae. Today, they have hardly any land on which to hunt and gather.